The house may be long from ready, but ladies' birthdays need celebrating. The doofus with the weird straw thing on his head is opening a bottle of champagne to celebrate the birthday of the Lady of Owlcroft. Hors d'oeuvres await on the sidebar (even if it is a tad low). The windows are not yet in and the concrete is not yet stained; as the sunlight spots show, even the roofing is not 100% complete here. This is the main living area, looking east; the masonry heater will eventually go just to the left of the "seats" being used here. 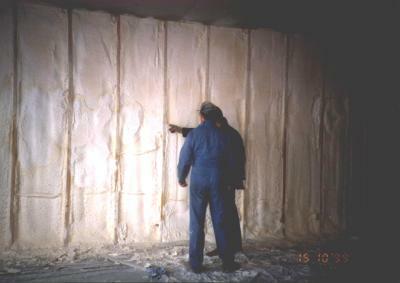 This shows an area of interior wall shortly after installation of the expanding polyurethane foam but before application of the gypsum-board firecover and knotty-pine wall surface. Polyurethane foam has an insulation value of over R-7 to the inch of depth. 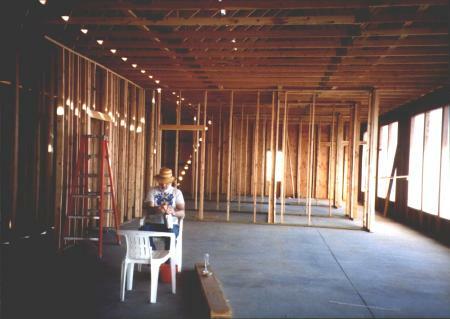 It also expands to completely fill all wall cavities, and bonds to the wood sheathing and studs, making an essentially air-tight envelope, eliminating the need for a separate vapor barrier or air barrier. The foam is nontoxic, non-nutrient to insects, and ^%#^$% expensive--but worth it. Owlcroft was specified to be airtight to 0.11 air changes an hour; it exceeded that, being blower-door tested at 0.10 air changes an hour. (Old houses are leaky, to 1.00 and often more air changes an hour; modern standards for "air-tight" houses are considered strong at about 0.35 air changes an hour; we are fanatics.) Air changes cost heat in the winter, as the incoming cold air must be heated to house temperature: the BTU cost can be amazing--often a large fraction, or even majority, of the heating need. So much for the construction phase. Now, to finish off your visit to this site, here are some peripherally relevant but possibly amusing Owlcroft "paired pix".